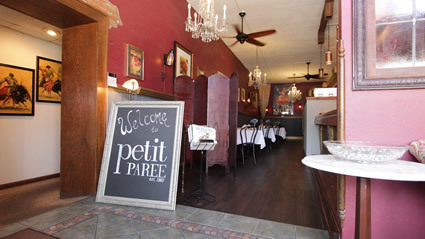 Petit Paree stands out as the “par excellence” among the St. Louis region’s best restaurants. Established in 1960 by it’s original owners Andy and Maybell Backy, Petit Paree offers casually elegant dining close to home in the heart of Festus, Missouri. Today, Petit Paree is owned and operated by the Tetrault family. As no strangers to the restaurant business, we pride ourselves on personal service and a friendly family atmosphere. At Petit Paree, you are our guest, not a client and certainly not a number. We like to boast a little bit of Parisian charm while maintaining you don’t have to go too far from home for an incredible dining experience, and high quality, freshly prepared, gourmet meals. To those who have been on this journey with our families, thank you for your business and we look forward to serving you. For our first time visitors – welcome, we truly hope you have a great experience. Please let us know if there is anything we can do to accommodate you and your party.